The scary truth is I’m not too sure where I find myself. Having taken time off post-PhD and more recently (this year) started to seriously look for work, I’ve struggled to focus my job search and identify jobs that I’m an ideal applicant for (i.e. able to meet all the key selection criteria). I’ve only seen one or two academic jobs I could apply for, which may suggest postdocs are my best option in academia. Moreover, I occasionally find myself feeling somewhat envious of others who have missionary zeal for a specific cause/idea or a very specific research agenda. They have focus. For example I recently read Fabio Rojas’s book Theory for the Working Sociologist (which is a good read) in which he summarises his research area as “the interaction of protest and organizations” (p.160). Six words! In Good To Great (New York: Century, 2001) the management scholar Jim Collins writes of the Hedgehog Idea: a central focus that enables a manager or organisation to allocate resources effectively. Karen Kelsky (The Professor Is In) and Robert J. Trew (Get Funded) also emphasise the importance of a self-directed research program. However, developing a self-directed research program is not always taught in a PhD program. Rather, it is often learned in the Post-Doc: a two-year or more period in which the new Early Career Researcher gains further specialised research training under the direction of an experienced mentor or team. This is often done in a university-based research Centre or Institute, and is increasingly aligned with their strategic research priorities. It took me more than a year of reflection to condense this research agenda down into such research questions. I see other, related areas such as economic statecraft and nuclear deterrence where it might be applied. These are out-of-scope for my PhD dissertation and they may inform future research. It also took me awhile to identify relevant experts, specific journals, and relevant book publishers. I’m still an emerging scholar so I’m slowly building my networks and reputation. This identity formation is important for Post-Doc roles. A Post-Doc is a period of intense and hopefully mouth-to-ear training. It does not necessarily lead to a sustained research career. Its two year time-frame is often really a year to 18 months once ‘revise and resubmit’ scheduling is factored in for publications. Centre and Institute Directors expect their Post-Docs to publish and to also apply for competitive grants. Furthermore, broader social engagement and impact is also now expected via The Conversation, media outlets, community consultation, and targeted social media (the source of ‘alt-metrics’). This can be a disillusioning shock to new Early Career Researchers. They may expect an Ivory Tower and instead encounter the contemporary neoliberal university. Having a self-directed research program is necessary to navigate this competitive environment. It tells you what to focus on, who to collaborate with, where to publish, who your national and international funders might be, and just as importantly, what to say no to. Research managers can create data analytics for it. Consider your research program to be the equivalent of an entrepreneurial or investor slide-deck: you can even use the popular business model canvas to brainstorm it. Even Fabio Rojas has a Google Scholar profile. His research program? Sociology. The recent Russian approach to strategy has linked nuclear, conventional and informational (cyber) tools of influence into one integrated mechanism. The article traces the intellectual history of this Russian cross-domain concept, discusses its essence and highlights its destabilising effects. By analysing a case outside of Western strategic thought, it demonstrates how strategic concepts evolve differently in various cultural realms and argues for a tailored approach for exploring coercion policies of different actors. The findings of the study are applicable beyond the Russian case, and relevant to scholars and actors exploring, utilising or responding to cross-domain coercion strategy. Dmitry Adamski expands fourth generation thinking in strategic culture to consider Russia’s ‘cross-domain coercion’ (conventional, nuclear, and informational) in a new Journal of Strategic Studies article (abstract above). Adamski’s important article has several implications. It links strategic culture to the policy challenge of nuclear deterrence in a multipolar world. It considers Russia’s contemporary strategic doctrines: it offers a comparative view to the sub-field literature’s usual emphasis on the United States and Europe. It considers strategic culture’s role in multidimensional coercion and strategic bargaining. It reflects Adamski’s intelligence and national security experience. I closed my laptop and walked out of my office. In that moment, I couldn’t bear to be surrounded by the trappings of a life that had just crumbled around me. The perfect reading lamp, the drawer of fountain pen ink, the dozens of pieces of scratch paper taped the walls, full of ideas to pursue. The hundreds of books surrounding me, collected over nearly a dozen years, seemed like nothing more than kindling in that moment. I cried, but pretty quickly I picked myself up and started thinking about the future. The circumstances of the job I didn’t get were particularly distressing, so I discussed it with non-academic friends, explaining over and over again that yes, this is the way my field works, and no, it wasn’t surprising or shocking to me, and no, I won’t be able to “come back” later, at least in the way that I’d want to, and yes, this was probably what was always going to happen. And then I started looking forward. Over the past 8 years I’ve interacted with about 80 Early Career Researchers (first five years after PhD conferral) at four Australian universities. I’ve seen some ECRs transform their research program and go on to be promoted to Associate Professor. I’ve seen some ECRs begin with optimism and then get weighted down by teaching and administrative demands. I’ve seen others like Bartram leave — and often go on to have successful ‘post-ac’ careers and fulfilling lives. The academic job market is a ruthless microcosm of the neoliberal economy. Post-2008, career advisers like Karen Kelsky and Inger Mewburn have emerged to share how Faculty Deans and tenure track committees think when making hiring decisions. Career post-mortems – once the domain of risk managers – now encompass the entire grad school experience. Centralised Research Offices now regularly use analytics like Scopus and Google Scholar citations, Thomson Reuters journal rankings, and engagement and impact information to evaluate scholars’ productivity. It’s not quite GE’s infamous ‘rank and yank’ system of performance appraisal – but as Bartram observes, it’s close: each year many ECRs leave the higher education sector. Unless you have an informed PhD Supervisor – or you have an ‘alt-ac’ career in university administration – this all may be invisible to you. The ECR experience can be a period of heightened positive illusions. Bartram in her heartfelt post mentions many of these: the camaraderie of fellow ECRs; the excitement of conferences; and the joy of getting your first couple of publications. However, Bartram also notes some of the barriers: pay-walled journals, intense teaching loads, and an organisational climate in which doctoral expertise is reshaped to instrumentalist ends. The gap between the intellectual ideals of contemporary scholarship and the organisational realities are often very confronting. Consequently, ECRs may go through a period of disillusionment whilst they learn how universities actually work. Career advisers like Kelsky and Mewburn are clear on how ECRs now need to self-manage their post-PhD trajectory. You need to have a fundable research problem with a 3-to-5 year outlook. You need to publish during and after your PhD to stand out competitively. You need to self-manage your public face via a professional website, LinkedIn, Google Scholar, and possibly Twitter for strategic, targeted outreach. The publications you write will create a track record that will underpin grant applications. You need to present at conferences and to organise a panel. You need to understand how journals’ editorial process works – which means cultivating a relationship as a reviewer and then as a writer. Some knowledge of intellectual property – copyright, trademarks, patents, and trade secrets – also helps. Much of the ECR period – particularly in Post-Doc roles – is about developing an identity as an independent scholar and learning these institutional norms. Many universities now run seminar programs to share this knowledge. Having an informed mentor also helps. The ECR needs to manage several different roles: new teacher, emerging scholar, counselor, and, paradoxically, entrepreneur of their own research program. In reality, this transformative process often needs to begin at the All But Dissertation stage of your PhD. As Bartram notes, ECRs are socialised into an academic, scholarly community. There is a gap between this ideal and how senior executives may view successful researchers: as revenue generators for the university. It is possible to balance the two: to build a community and also to generate income through grants, contracts, tenders, and panels. How to reconcile these two mindsets — and how to support those scholars like Bartram who decide to pursue ‘post-ac’ options — will be a challenge for university research managers. Bartram’s powerful post suggests that we need more Elisabeth Kubler-Ross or the Tibetan Bardo Thodol — as a counterpoint to Al ‘Chainsaw’ Dunlap-inspired downsizing, austerity budgets, and cost reduction. RAND’s Jack Snyder originally conceptualised strategic culture as a cross-comparative framework for evaluating adversaries’ use of force. Strategic culture’s potential for informing strategic bargaining remains under-theorised. 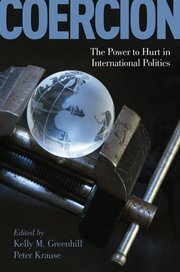 Kelly M. Greenhill and Peter M. Krause‘s new edited collection Coercion: The Power to Hurt in International Politics (New York: Oxford University Press, 2018) offers conceptual, theory-building, and policy insights on particularly non-state actors in a multipolar world who use a range of military and non-military instruments. Coercion has important insights for scholars who wish to further progress a fourth generation research agenda in strategic culture.